Have the freedom to explore Winton and the best it has to offer. Visit Carisbrooke Station to see the spectacular scenery of the region, marvel at the preservation of 3300 dinosaur footprints made 95 million years ago at the Dinosaur Stampede, see the dinosaur bones being found in the local area at the Australian Age of Dinosaurs, hear about the explorers and pioneers of the region, the hardship of station life and the events that shaped Winton and its people. This 4 night package has a weekly departure that links with the Spirit of the Outback rail. Arrive in Winton and transfer to your accommodation. Tonight, enjoy dinner outback style at the Tattersall’s Hotel with indoor and alfresco dining. Visit Carisbrooke Station and the Dinosaur Stampede in one day tour. The Dinosaur Stampede at Lark Quarry Conservation Park preserves 3300 dinosaur footprints that were made 95 million years ago. We will be enthralled by the tour at this site. Then we travel to Carisbrooke Station to marvel at the natural wonders and history of this spectacular location. 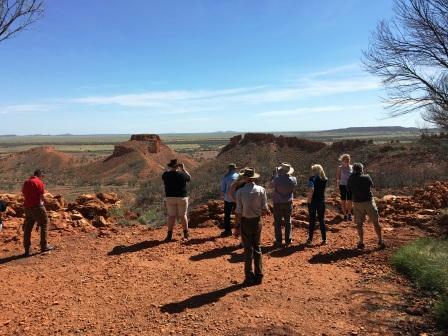 See the Three Sisters, fossick for opal and just sit back and enjoy the open expanse of the landscape. shed, Scrammy Gorge and Lookout and permanent water holes. enjoy the sunset from the Jump-up (mesa) with spectacular views over the surrounding landscape. around Opalton and an historic account of the Corfield and Fitzmaurice general store. Opal Walk including behind the scenes history of the Royal Open Air Theatre. This evening, enjoy dinner at the Tattersall’s Hotel before an Evening of Nostalgia at the Royal Open Air Theatre. Rail: on the Winton Connect Rail Bus bound for Longreach and the Spirit of the Outback train. Flights: Transfers to Winton Airport available upon request.